My son’s elementary school is one street over from my office. As updates on the Brussels attack flooded yesterday’s newsflow, a 5 minute chorus of gunshots came from the direction of the school. I grabbed my gun and headed over. Thankfully, the shots were coming from somewhere behind the playground. A false alarm close to home isn’t comparable to yesterday’s real-life tragedy. The incident, however, left me further despondent about our new actuality of risk but heartened that I wasn’t the only one who showed up at the school. Someone was going to walk out of that building and it wasn’t going to be the wrong person. The ‘heightened risk’ message has been ubiquitous over the last year+ – to the point where it’s easy to tune out. But verbal posturing chased by indifference or inaction can’t be our model or legacy. Now is truly a time, not for passive or fearful “insouciance”, but for hardened acceptance of a new exigent reality. That’s not a political point and I’m talking less about the official government response or bureaucratic action than about the personal metamorphosis required for effectively operating within that new reality and its contingencies. Less superficial manic reactionism, more durable proactivity. Empathy substituted for apathy, humanism for self-absorption. Back to the Global Macro Grind …. 40% of Fortune 500 companies in the United States were founded by immigrants or their children (The Economist (Here)). From an economic perspective, “unity” and the efficient flow of capital (human and physical) remains the right recipe for innovation – particularly as the domestic economy becomes increasingly reliant on productivity improvements and immigration trends to drive growth. 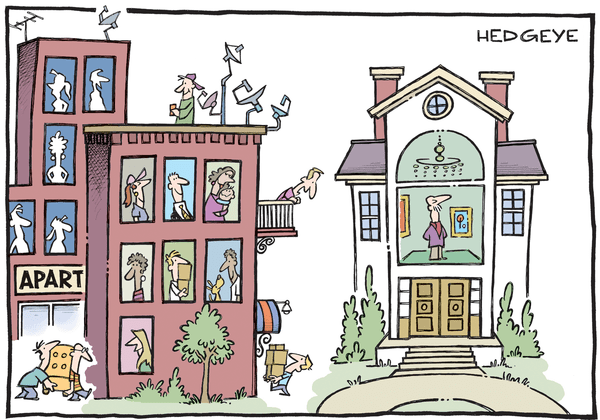 … and with the Boomer population bolus having made its way through the working age population and female entre into the workforce now a rearview phenomenon we’ve already cashed in our golden ticket with respect to growth in “how many people are making stuff”. I wouldn’t call it a love-hate relationship necessarily, but I have mixed feelings about demographics. On the one hand they are crawlingly glacial and incapable of backstopping a thesis over most investible durations. On the other hand, it’s hard to argue that knowing whether a particular industry’s demand demographic over the next decade is going to be +5% or -5% doesn’t matter or that the secular drivers of slower (growth) and lower (rates/inflation) for longer are practically inconsequential. In talking with clients – even macro-centric ones – it’s clear that immigration is a vastly underappreciated dynamic. Indeed, over the last four decades, net immigration has accounted for 30% of total population growth in the U.S. And because 2nd generation immigrants are counted as native born (and immigrants tend to have higher fertility rates, foreign born contribution to population growth is generally understated. On the Housing side of Macro, we recently hosted a call with our new sector head of Demography, Neil Howe, titled: Get Ready For the Demographic “New Normal” In Housing. Big Picture | Fertility & Immigration: Fertility rates in both North and South America (a key driver of domestic immigration trends) are falling with significant consequences for domestic population growth. 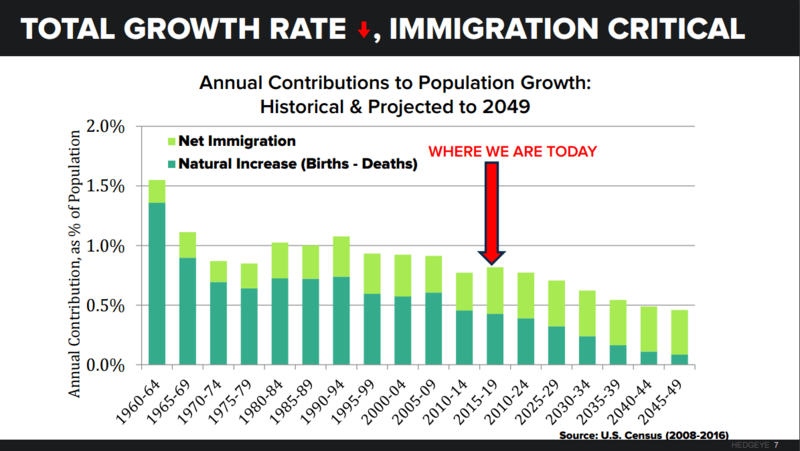 As the Chart of the Day below illustrates, Natural population growth is expected to trend toward 0% over the next 30 years with net immigration becoming an increasingly important growth driver. Declining fertility rates across Mexico and key source countries in Central/South American broadly suggest the past will not be prologue for the long-term forward trend in immigration. Gen X | The Lost (Housing) Generation: Homeownership and net wealth among Gen X’ers suffered the most during the Great Recession. A large number never formed households or became homeowners and many that did ended up in negative or near negative equity positions. Their disadvantaged position limits their capacity for “trading up” and will continue to weigh on housing turnover broadly. Whether this generation eventually transitions to ownership to the same extent as previous generations remains an open question. The Demand Sweet Spot | The millennial wave is currently driving rental demand and will support starter home demand over the next half decade+ and trade-up home demand in the following decade. Demand for “mid-life luxury” homes will see a drought as the baby bust generation reaches 50-64YOA. Boomers and the emergent trend towards aging in place will continue to drive a boon in remodeling over the next decade and accelerating demand for senior and assisted living units after that as the boomer bulge moves into their mid-80’s. Elsewhere on the housing front, the WSJ reported yesterday (HERE) that the GSE’s (Fannie Mae and Freddie Mac) – after years of back & forth on the issue - are set to announce a principal forgiveness program for a select group of ~50K underwater homeowner’s. There are still 4.3 million borrowers with negative equity positions. No matter how theoretically justified the programs parameters, forgiving principal balances on just 50K of those will carry an air of arbitrariness/unfairness. Only forgiving balances for borrowers who have been delinquent is a slippery slope and probably sends the wrong message to the balance of underwater borrowers. In the unlikely scenario that every single one of these 50k homes came onto the market as a result, it would only increase inventory by 2-3% and do little to resolve the prevailing supply problem. On the fundamental side, we got the brick of a print we’ve been warning you about out of Existing Home Sales on Monday as closed transaction volume made a new 13-month low. Looking forward, we’re more interested in the Pending Homes Sales (PHS) data for February next Monday as it will give us the lead read on March Existing Home Sales. As it stands, PHS have decelerated for 9-months off the April 2015 rate-of-change peak and we continue to expect sales in the existing market to decelerate through 1H16 with a strong possibility for negative mid-single digit volume growth against peak PHS comps in April/May. Given the lagged relationship of home prices to volume (rate-of-change in home prices lag the rate-of-change in demand by 9-12 months) we expect HPI trends to flat-line and begin to roll as we move through 1H16, representing an addition fundamental headwind for housing related equities. Your analytics need not have gone through puberty to understand that slowing price + slowing volume is not a bullish fundamental factor set. NKE | 52% Gross Margin… Anyone?